Perhaps the most talented and gifted rider of all time, the current MotoGP World Champion Valentino Rossi celebrates his 30th birthday on Monday. As he prepares to undertake his 14th season of World Championship competition the legendary Italian rider Valentino Rossi turns 30 on Monday and he is sure to be celebrating in style. The reigning king of MotoGP, who last year won his sixth premier class title with an incredible haul of nine wins, 16 podiums and 373 points, will go in search of further glory in 2009, but as he reaches 30 years of age will surely allow himself a moment of reflection on what has been a truly remarkable career to date. The Doctor, as he is affectionately known to his millions of fans across the globe, has been the World Champion in all three Grand Prix categories, taking 125cc, 250cc and 500cc/MotoGP titles in his second season in each class. He is just the second rider in history to have won all three titles, alongside Englishman Phil Read. Rossi is the only man to have won the premier class MotoGP World Championship with 500cc, 990cc and 800cc machinery, returning to the top in 2008 after two seasons away from the pinnacle. In MotoGP’s first ever visit to Indianapolis last year, the Fiat Yamaha rider took the record for all-time premier class race victories from one of his idols Giacomo Agostini, incidentally the only other rider to have regained the title after two years away, with a 69th triumph. Rossi raised that tally to 71 with further wins at Motegi and Sepang at the end of last season. The son of Graziano Rossi, a celebrated rider of the 1970s, the younger Rossi entered Grand Prix racing with Aprilia in 1996, even winning a 125cc race in his first season. He went on to win the 125 world title in 1997, and after a move up to 250s with the Italian brand, he collected the quarter-litre title in 1999. He then made a move up to the premier 500cc class in 2000 with Honda, challenging for the title in the first season, picking up two victories and second place overall in the championship. After winning the last 500cc World Championship in 2001, the following year he dominated once again in the first ever MotoGP four-stroke series onboard the Honda RC211V. He was just as untouchable the following season, before accepting the biggest challenge of his career by leaving the Honda camp and taking a Yamaha ride for 2004. An historic year for Rossi began in the first race at Welkom, when he became the first rider ever to take consecutive victories for different factories, with a further eight wins sealing Yamaha’s first title in over a decade. In 2005 he added to his previous triumphs, again achieving nine wins on the road to the title, his second with the Yamaha team. Linked with a move to four wheels, Rossi announced that he would stay with Yamaha for another year at Mugello in 2006, and was further spurred on by World Championship wins for rivals Nicky Hayden and Casey Stoner – ultimately regaining the title last September in Japan. Highlighting his dominance during his career, Rossi has ended eight of his thirteen Grand Prix seasons as a World Champion, whilst in the premier class alone he has a win percentage of 47.3% with his 71 victories in 150 races, putting him well ahead of Mick Doohan (39.4%) and Kenny Roberts Sr (37.9%). Signed up for the next two seasons with Fiat Yamaha, Rossi now has his sights set on Agostini’s record of eight premier class titles and the accolade of the greatest rider of all time. Like the iconic Agostini he is assured of officially becoming a MotoGP Legend when he eventually retires. Rossi’s most recent outing on MotoGP machinery saw him commence his title defence preparations with a successful test in Malaysia, his trip to South East Asia also giving him the opportunity to make a public appearance for Yamaha Indonesia in Jakarta, where he was received by thousands of ecstatic fans – once again underlining his enduring popularity as a truly global sporting hero. The MotoGP World Champion Valentino Rossi has received Happy 30th Birthday messages from a number of his closest friends, his family and several World Championship rivals. Valentino Rossi has had an immensely successful career to date, winning eight World Championships, 97 races in all classes and becoming the most successful premier-class rider of all time. As he enters his 14th season in the MotoGP, his sixth with Yamaha, he is still a dominating force in the sport, having recaptured the title in typically exciting style last season. Below is a collection of quotes from colleagues, fellow riders, family members and a few of his more famous fans. 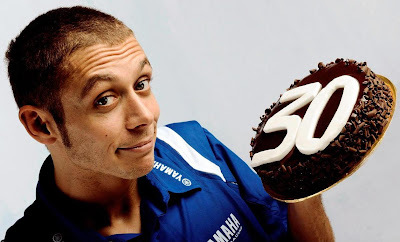 Courtesy of Yamaha Factory Racing, some are recollections of favourite moments with Valentino, whilst some are simply messages for him on the day he turns 30. Facebook hiện đã có phiên bản mới nhất dành cho điện thoại di động, với những tính năng mới vô cùng hấp dẫn, nhanh tay tai facebook cho dien thoai của mình các bạn nhé. Với đồ họa đẹp, những nét cải tiến mới tai facebook ve dien thoai bạn sẽ được trải nghiệm những điều thú vị từ phiên bản mới này, thật hấp dẫn phải không nào. Giới thiệu tới các bạn một game được nhiều người rất yêu thích nhé, bạn đã tai iwin 270 về máy chưa, đây là một game đánh bài online đang được ưa chuộng nhất hiện nay. Chỉ với thao tác tai game iwin 270 đơn giản về máy, bạn sẽ có những phút giây thư giãn tuyệt vời bên dế yêu. Chúc các bạn vui vẻ nhé. Cùng điểm danh những ứng dụng đang được yêu thích nhất, đầu tiên là phải kể đến facebook, hãy cùng tai facebook ve dien thoai của mình và giải trí cùng với dế yêu. Việc tai facebook ve may là hoàn toàn miễn phí, hãy nhanh tay tải về nhé. Một ứng dụng nghe nhạc trực tuyến cho điện thoại, tai phan mem zing mp3 về máy và thao hồ thưởng thức âm nhạc với kho âm nhạc khổng lồ. CH play là cửa hàng ứng dụng phong phú, [download ch play về máy bạn sẽ có thể tải về máy mình các phần mềm và trò chơi hot nhất hiện nay. Các ứng dụng hàng đầu cho điện thoại Cùng khám phá thế giới game đầy hấp dẫn trang iwin, tai game iwin ve dien thoai sam sung - tai iwin ve dien thoai về máy để chơi thôi nào. tai game chem trai cay mien phi vui nhộn đang chờ đợi bạn, nhanh tay tải về chơi thôi nào.